This post was first featured on DIY Budget Girl for Chelsey Hartman’s Back to Basics series. Does the batter or breading fall off your food when you fry it? Would you like to make your pastries look shiny? I typically use water as the liquid, some people use milk. Simply crack an egg into a bowl, use a whisk to beat the egg, then pour in two tablespoons of water. Then use the whisk again. If you need more, add two tablespoons of water for each egg that you use. I use an egg wash to coat chicken and seafood before frying it. It allows the batter to stick to the food as it fries. Dip a piece of the food that you are preparing in the bowl of egg wash to fully coat it. Shake it over the bowl to remove excess. Then dip the food into the batter or breading that you are using to fry it. 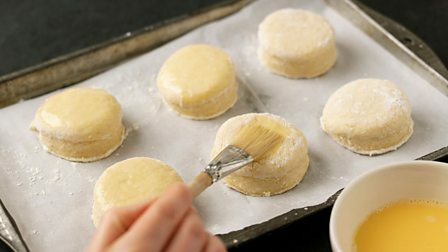 If you are baking and want a shiny pie crust or biscuits, simply brush the egg wash on top of the unbaked bread with a pastry brush. Do you use an egg wash for your dishes? Do you bake? From a mix or from scratch? Using milk was new to me. I only used water before and then I did a little research. On the rare occasions I bake it’s usually from scratch. I should employ an egg wash more often but with eggs so expensive these days I often just go with milk. One of my goals for 2015 is to learn how to bake! And if I can do it from scratch, that would be the icing on the cake. Pun intended! 🙂 Thanks Stella! Great post! Pinned and tweeted. Thank you for being a part of our party. I hope to see you on tonight at 7 pm. It wouldn’t be a party without you! Thanks so much, Kim! I’ll head over to your party now.